Vertex VX-450 Series Intrinsically-Safe Option Now Available | Magnum Electronics, Inc. The rugged VX-450 series is now available with the intrinsically-safe (IS) option for use in hazardous environments. The radio must be ordered with the QA03904AA option that provides the high-capacity AAH13X002 FNB-V113LIIS battery. IS models are SGS certified to the requirements of ANSI/UL913 5th Edition for use in Class I, II, III, Division 1; Groups C,D,E,F,G; Temp T3C hazardous locations. 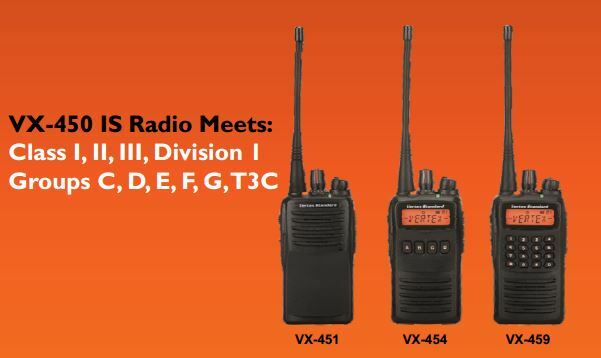 When using (IS) Approved radios you must also use audio accessories that carry the same rating. Existing VX-451, VX-454, and VX-459 radios retrofitted with (IS) batteries and accessories are NOT intrinsically-safe. The radio must be ordered from the factory with the (IS) option and carry the certification label. This entry was posted in New Products, Portable Radios, Vertex-Standard and tagged 2-way radio, Batteries, communications, Intrinsically-safe by magnumelectronics. Bookmark the permalink.